This year's WWDC keynote saw no new hardware announcements and instead it was iOS that took center stage. Apple unveiled the next major release, iOS 5, for iPhone, iPad and iPod touch, which packs over 200 new features or say they say. The greatest new feature of iOS 5 is the notification area, which comes to replace the annoying pop-ups. Taking a leaf of Google's Android book, the company has added a dedicated screen that you open by pulling from the top of the screen downwards. It contains all your notifications and if you click one of them it takes you to the app responsible for it. Clicking on the X icon on the right removes the notification. We didn't see an Android-like button for clearing all notifications, or quick radio settings (i.e. Wi-Fi, GPS or Bluetooth toggles) though. By the way the Notification center, as Apple likes to call it, also features stock updates and weather information. Also visually, it looks like quite a ripoff of David Ashman's popular LockInfo app available as an unofficial tweak from Cydia. But is Apple running out of fresh ideas? Next came Twitter integration, which covers Contacts, Safari, Photos, Camera, YouTube and Maps. You can now Tweet from all those apps and your contacts are automatically synced with their Twitter accounts. It's a rather strange move from Apple adding Twitter integration, when fans have been asking for Facebook for what seems like ages. makes us wonder if perhaps there's some grudge going on between the two companies. The company is also launching the iMessage service, which is basically an IM client built-in right into the Message app. It supports sending texts, photos, videos, contacts to both single users and groups over encrypted connection. And yes, this time it works over both Wi-Fi and 3G from the start. 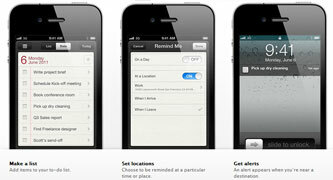 Reminders were also unveiled, bringing all your to-dos together and allowing you to set-up, well, reminders. The good news is that the app is location aware so it can now remind you of events based on where you are. It’s nothing that you couldn't achieve with an app anyway, but it's always better when things come built-in (for free!). The camera department got an upgrade, too, with a dedicated camera shortcut landing on the lockscreen and some settings finally making their way to the UI. You now get the option to add grid-lines to your viewfinder, lock exposure and focus by pressing on the screen and using the digital zoom by pinching in ala Galaxy S II. Oh, and you can now use the volume key for taking photos - it's not as good as a dedicated two-position camera key, but it's way better than nothing. And yes, it's the same tweak that Apple banned from the AppStore a while ago. The Safari browser was arguably the app to get the most significant update, but alas, those were mostly for its iPad version. 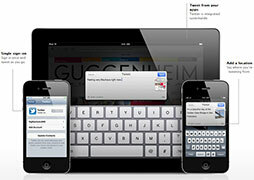 The Apple slate got tabbed browsing, bringing it on par with the competition. 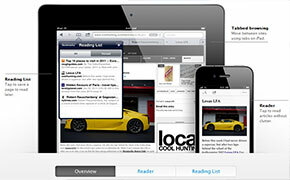 The Reading list plug-in for both the iPad and the little iOS devices allows you to save pages for reading later. Those get synced between devices too. A particularly cool-sounding new feature of the Safari, called Safari Reader, Safari Reader lets you see web articles sans ads or clutter so you can read without distractions. It also supposedly merges multi-page articles in one big page for more convenient reading. 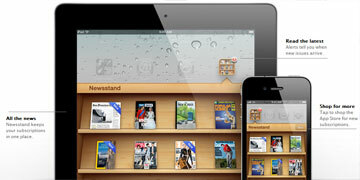 Moving on, the iOS5 brings the Newsstand app - it gathers all magazine and newspaper subscriptions in one place, making it easier for you to access them. The photos app gets image editing, allowing you to crop and edit images straight on your iOS device. Editing boils down to red-eye removal and Auto-enhance so don't get your hopes too high, though. 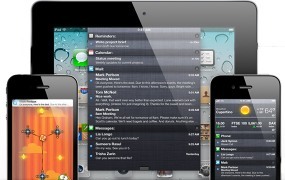 The Game center is another one of the iOS key features to benefits from iOS 5. The new version of the platform will enable posting of profile pictures, new friends recommendations based on the games you play and the players you already know. New overall achievement scores are introduced, too. 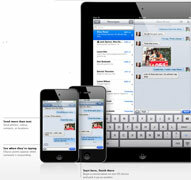 iOS will also Apple decided to break the computer-chains imposed on their iOS devices. You will no longer need to connect your iPhone/iPad/iPod to a computer before your first use or for each firmware update. Starting with iOS 5 updates will be pushed over the air and they will come in smaller sizes thanks to the implemented Delta encoding. While it sounds good, it sure sound like it's going to make the job of jailbreakers all the harder. Among the other noteworthy updates are a system-wide dictionary as well as rich text formatting and flagging of messages in the email app. iOS 5 will be pushed to end users this Fall, which seems like a pretty long wait considering that it isn't the major step forward that everyone was expecting it to be. At least that gives us a rough estimation as of when we should expect the next iPhone - be it iPhone 5 or 4S. Obviously a late September release is the best we can hope for. The iDevices eligible for an upgrade are the iPhone 3GS and 4, the iPad and iPad 2 and latest two generation of iPod touch - 3rd and 4th. The good news is that Apple announcements didn't end with the iOS 5. The company introduced its iCloud online synching service, which might as well be more beneficial to iOS users than the firmware update. Check out what that's all about here. 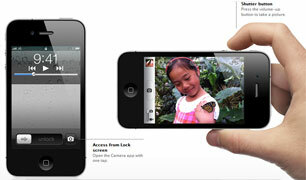 In case you feel like getting a dose of video demos, you can check out the iOS 5 new features coverage in our blog.